As usual, potentially important discoveries were made on the last day! 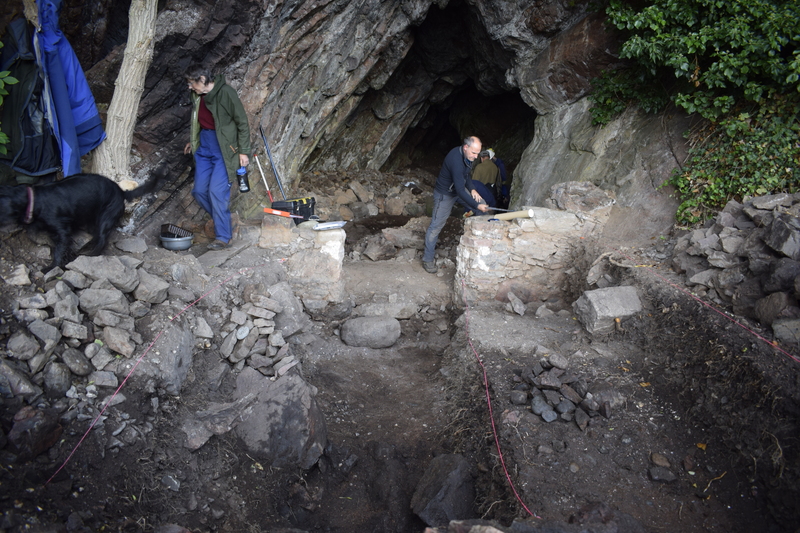 In 2B, around 1.5 metres away from where we had recovered Rosemarkie Man in 2016, Tim Blackie uncovered articulated ribs within a roughly-built, cist-type structure. By the end of the day, it was obvious that these remains were animal, probably from cattle or deer. 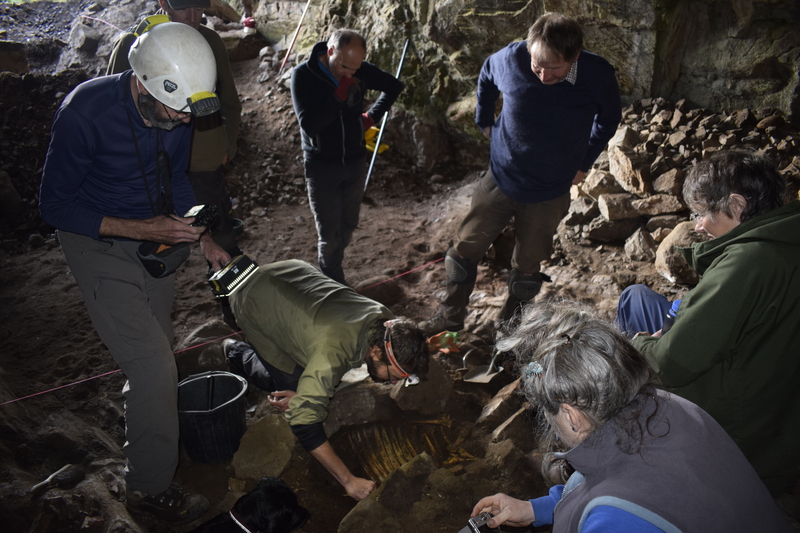 I returned to the cave a couple of days later to complete the excavation of these remains, with assistance from Allan Mackenzie (unfortunately, Tim had been struck down by a bug)! We now have a good sequence and date for the animal remains, which proved to be from an adult cow. 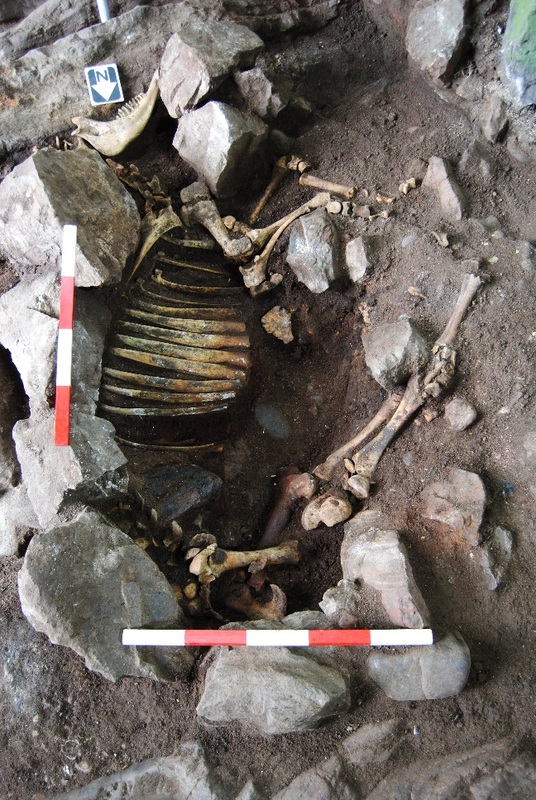 A post-medieval hearth had been constructed in the back of the cave, between two bedrock ribs on the natural sand, and using a large and fat inclined slab of rock. 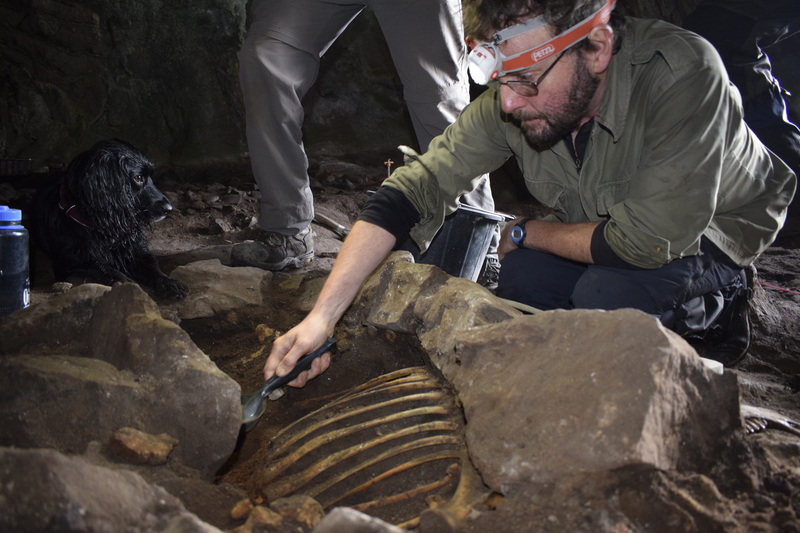 At some stage during the use of this feature, a pit was cut through the ashy spreads to the west of the hearth and the almost complete (the only bits missing were the cranium and one lower mandible) articulated remains of the cow was laid on its side. The pit did not quite accommodate the animals remains, so its legs protruded upwards at an angle to rest on accumulating midden deposits. A stone setting some 1.4 metres long was then constructed over the animal using angular rocks, aligned N-S, on the same alignment as the animal remains. The cow’s spinal column was partially covered by the setting on the east side, while stone were placed across the limbs on the west side. Therefore, the setting did not contain the animal, but rested on top of it – after which two larger stones were placed within the setting covering the lower abdomen area, and smaller stones over the chest area. 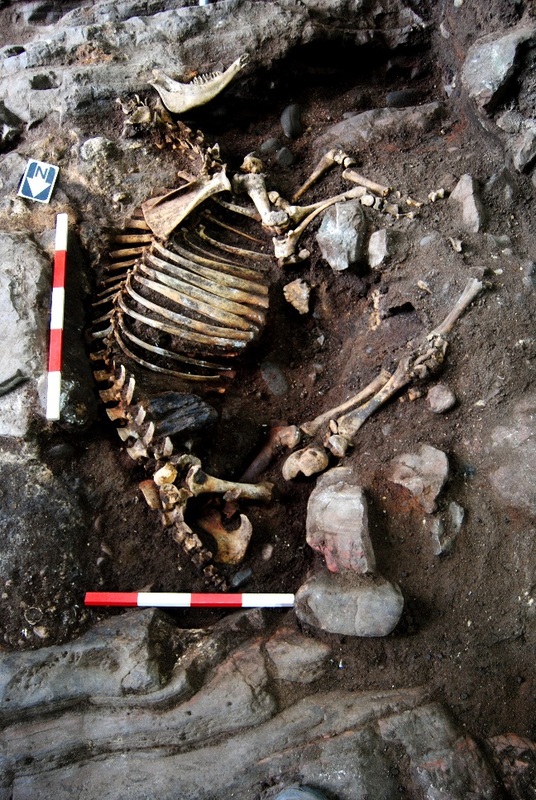 The stone setting covering the cow skeleton prior to excavation. The second upper hearth was built to the east of the stone setting covering the animal’s remains, using the stones on its east side as a back for the hearth (to which were added additional smaller stones to form a more circular setting on this side of the hearth). 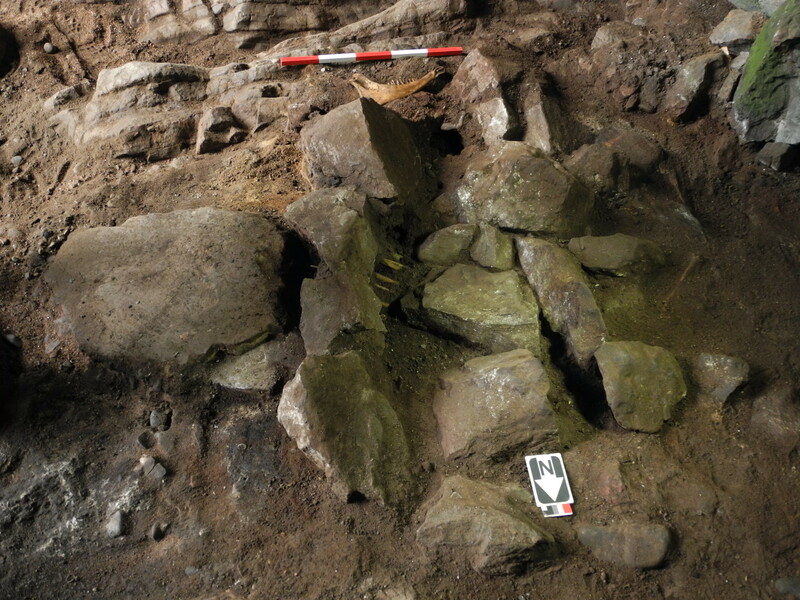 Ash from the use of the hearth had filtered down into the cist-like feature, after which midden and floor deposits accumulated, completely burying the setting and hearths. Excavation of the deposits within the stone setting produced glass, ceramics, clay pipe fragments, a small button, burnt wood, a couple of copper-alloy nails, iron nails and leather off-cuts. When Allan removed the lower half of the rib cage, he uncovered the complete leather sole of a small shoe or boot, proving that the carcass of the cow was deposited during the post-medieval period. Above and Below: Paul carefully excavates the animal remains. Although the cranium was missing from the remains, we did not notice any butchery on the animals bones – although this will require confirmation from a specialist. So, the million dollar question…………why place the remains of a complete cow carcass in the back of the cave, where you were living and carrying out craft activities? Me thinks we will have to conduct some research on Tinker/Traveller beliefs and customs…………. 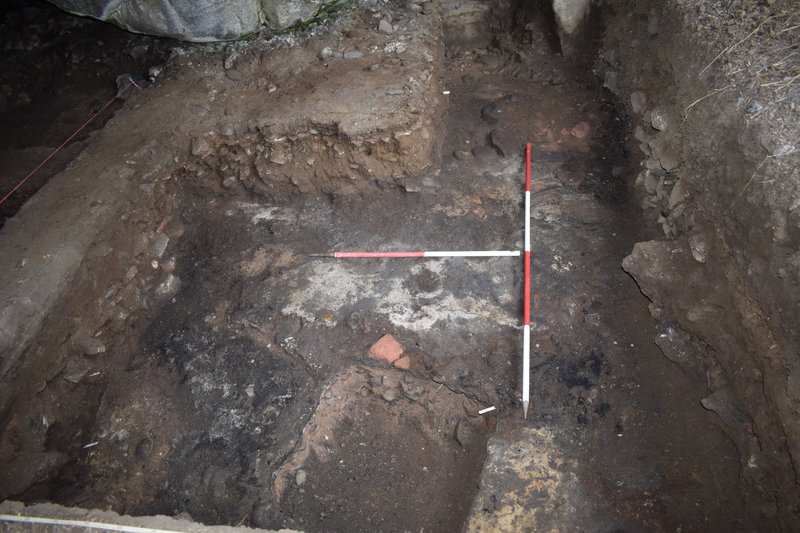 I have attached a couple of images showing the excavation of the stone setting; the first after removal of the stones covering the legs on the west side (below left); and a shot revealing the cow skeleton below right. 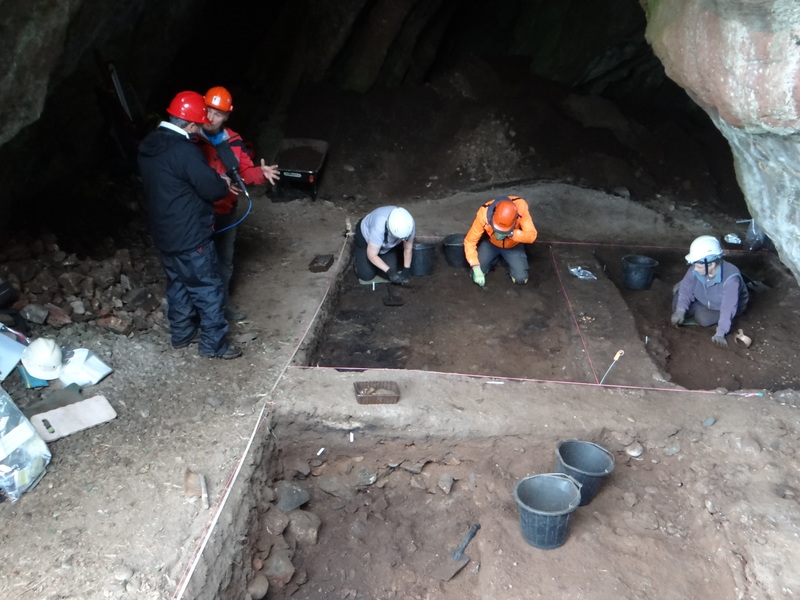 Cave 1B is the largest of the Rosemarkie caves at around 21 x 10 x 5 metres high. 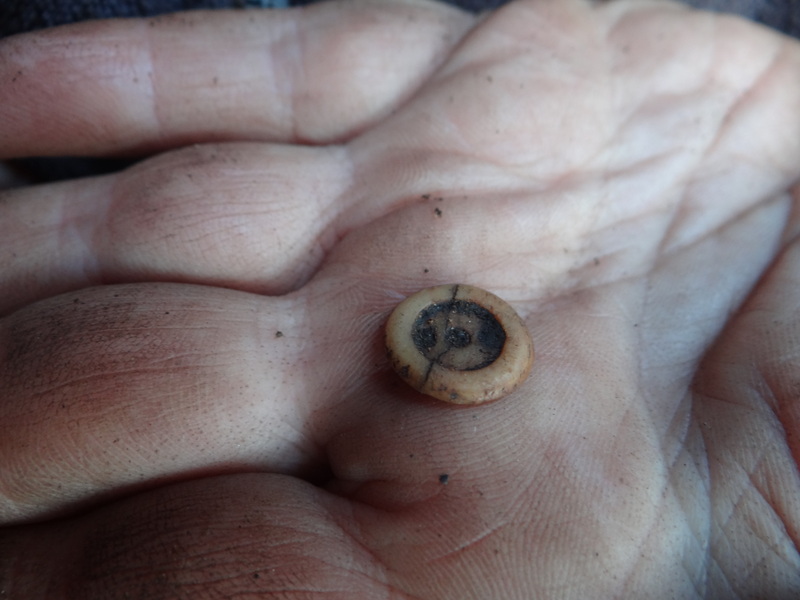 In the upper deposits a number of hearth/ spot fire settings were found dating to the 19th C period of “traveller” occupation. 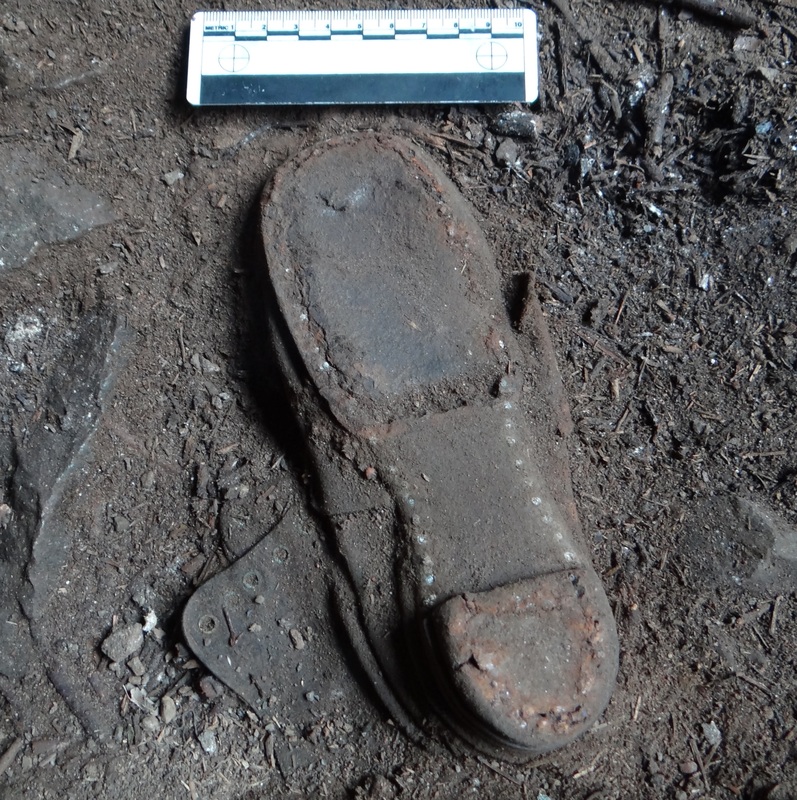 We also uncovered layers of bracken matting and a number of evocative artefacts – see the boot and button pictures at the top of the post. This is a previously dug test pit in 1B that was re-excavated this year. It originally reached a depth of 1.4 metres with a possible stake hole at the base. 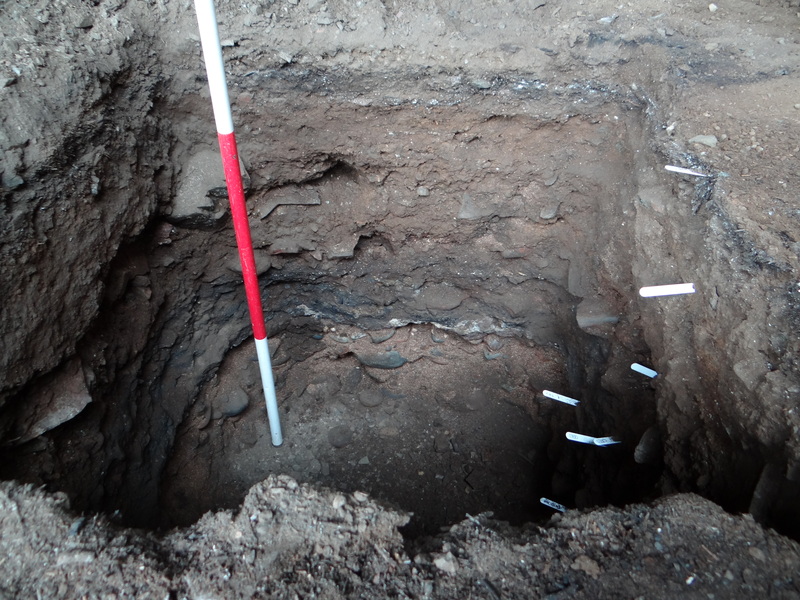 The substantial charcoal rich/ ashy layer close to the bottom yielded 7th to 9th century dates. This picture shows the trench cleaned back to the early medieval horizon on the last day of excavation 2017, including the remains of the test pit in the foreground. The very firm ash deposit on stone slabs appears to form a horseshoe shaped setting in the area where the ranging poles have been placed. It is hoped that this feature will be resolved when RCP return to the cave next year. 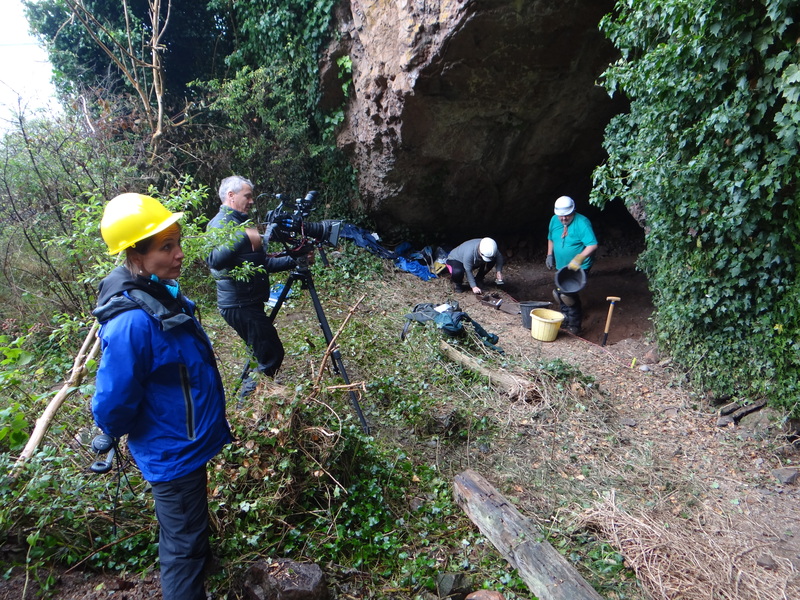 Some further excitement for this year’s dig was provided by the appearance of the BBC to film us for Landward (due to air Friday 13th October – http://www.bbc.co.uk/programmes/b097thcg) and record us for Scotland Outdoors on the radio (listen here). RCP Data Structure Report 2017. Thanks to all the hard working 2017 volunteers from NOSAS and elsewhere. See our other RCP articles here and here.